The role of social media in publishing continues to fascinate me. Take Sergeant Colin Taylor. 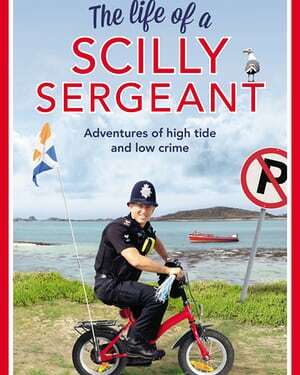 He was detective constable on the beautiful Isles of Scilly for around seven years. Scilly has approximately 2,600 inhabitants, yet Colin’s humorous Facebook and Twitter posts from his social media accounts amassed 60,000 followers. This level of demand for his humorous accounts of policing the Isles resulted in him writing a book, which has been equally well received. The challenges of travelling between islands to collar a suspect (without resort to an official police boat). The potential loneliness of usually patrolling on your own. Acting as mother hen to stag parties, to ensure they make it onto the last boat off the islands. The dis/advantages of a custodial suite that is essentially built into the centre of the police house. How to manage looters when there are too few officers to form an effective cordon. Gently amusing throughout. An insight into another time and world. A bit of an insight into policing. Colin’s gentle, self-deprecating take on everything related to his job and his life makes this a pleasure to read. More than that: he seems to be such a genuinely lovely person, equally happy when speed gunning the school children’s science projects, teaching his children about boats, or reading police reports while sat next to an aged lady in a care home so she can enjoy the peace and memories that the sight of a police uniform affords her. This is gentle immersion in a world where children as young as twelve confidently and competently navigate their own boats around the challenging coastline of Scilly (whose risky coastline was graded 11 on a scale of 1-10) but have no experience of or exposure to traffic. It is with sadness that I have to report that Sergeant Colin Taylor has recently departed Scilly and handed over control of the social media pages to a colleague. I doubt whether the new incumbent will sustain the level of humour followers have enjoyed, though I imagine that the actual policing will be similar. This is a delightful insight into a different, simpler way of life. I shall be deeply surprised if it doesn’t inspire a few more people to holiday on the fair Isles, or even up sticks and move there (which brings its own set of challenges).